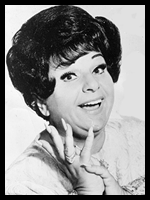 Totie Fields (1930-1978) was a groundbreaking comedienne in the 1960’s. She took a page from Phyllis Diller and turned it into a full length persona. At a time when “thin was in” she was unafraid to poke fun at herself- and in doing so made us all more comfortable with ourselves and our own shortcomings. Born Sophie Feldman in Hartford, Connecticut in 1930, she began her career as a singer in local nightclubs around Boston. She was still in High School at the time. As her popularity rose she changed her name to Totie, which was a childhood nickname, and changed her last name to Fields. In New York she began doing the nightclub circuit. With her combination of singing and comedy she caught the eye of Ed Sullivan one evening at the Copacabana. Her first big break would come on his show. Soon she was performing on all the talk shows such as Mike Douglas, Merv Griffin and on The Tonight Show as well. She was everywhere, including the Brighton Beach Swimclub where I saw her in 1965. She was dressed in a wildly patterned shift dress that would have been the envy of "Mama Cass." Her struggles with her weight were a big part of her act. In 1976 she was diagnosed with a blood clot and her left leg was amputated above the knee. This brought a new meaning to the phrase “break a leg” and she soldiered on, if only briefly, before her next health crisis. She did a one woman show in 1977, unheard of at the time, and opened the show in her wheelchair. Suffering 2 heart attacks and breast cancer, she kept performing, using her infirmities as part of her act. In 1978 she was voted “Entertainer of the Year” and "Female Comedy Star of the Year” by the American Guild of Variety Artists. The honors came just in time. In August of 1978 she was appearing at the Sahara Hotel in Las Vegas when she suffered a fatal pulmonary embolism. 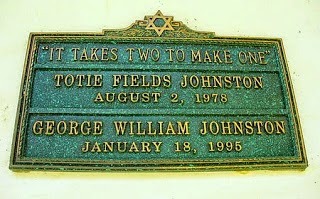 Originally buried in Las Vegas she was later moved to Los Angeles and buried beside her husband who passed away in 1995. But she's still around- you can bring her up on You Tube anytime you like. She's still funny and in some ways; particularly in issues about body image; more relevant than ever.